Forget counting out exact change and printing paper receipts – cash is no longer the preferred means of payment for this generation of students. Cashless transactions are taking the form of debit/credit cards, student IDs with reloadable funds, and – perhaps the future of campus payments – NFC-enabled mobile wallets such as Google Pay and Apple Pay. Some schools are starting to adapt to these advances by going completely cashless. What are the benefits of a cashless campus? Security is the most often-cited reason. Students without the need to carry cash are less likely to be victims of robbery or petty crime. Schools, campus businesses, and their employees do not need to worry about the security of cash drawers or needing a safe in their back office. Secondly is convenience. Transactions are made in seconds with the swipe of a card or tap of a smartphone. No long lines, no counting bills or double-checking change given! And since students most often choose card or mobile payments for everyday transactions, it makes sense to offer them the technology they prefer. For campus employees, there is the elimination of having to count and account for the cash drawer at the end of each shift. In response to these payment trends, Compuwerx recently rolled out its Pay Anywhere system. 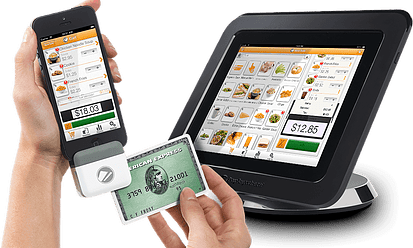 The all-in-one system accepts credit and debit cards (including both a chip reader and magnetic stripe reader) and mobile NFC payments/contactless cards. Receipts are conveniently sent by email or text, with the additional option of printing a paper receipt if requested. For more information on Pay Anywhere, please visit our website!